Fresh Fresh grinds are the key to making coffee with more flavor and body. Preference Coffee flavor and strength is a personal preference. Vary the type of coffee beans, amount of coffee and fineness of grind to achieve the flavor you prefer. Fresh roast Use freshly roasted coffee beans, preferably with a ‘roasted on’ date. Storage Store coffee beans in a dark, cool and dry place. Vacuum seal if possible. Fresh beans Buy coffee beans in small batches to reduce the storage time and store no more than one week’s supply at any time. Grind, brew Once coffee is ground it quickly loses its flavor and aroma. 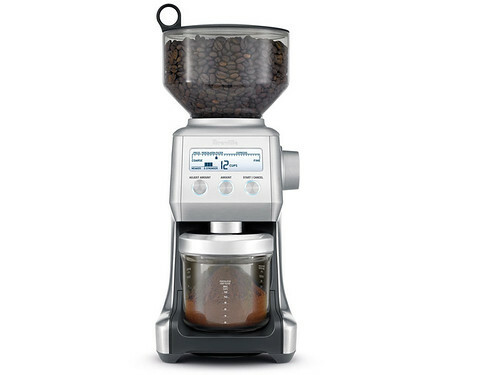 For best results, grind beans immediately before brewing. Use soon Only grind the amount of coffee you will use for preparing coffee within the next hour. Ground coffee looses its aroma and flavor very fast and attracts other odors. Bean storage Do not store beans in the Bean Hopper for a prolonged period. Empty When storing the grinder, run the grinder empty to clear the Grind Outlet of any beans. 2 seconds Run grinder for 2 seconds before each use for maximum freshness. Maintenance Clean the Bean Hopper and Conical Burrs regularly. Automatic coffee centers If your coffee or espresso brews too fast, try a finer grind size setting. If your coffee or espresso brews too slow, try a coarser grind size setting. For French Press Please follow the instructions of your French Press coffee maker (after pouring water over the ground coffee, stir thoroughly to prevent the ground coffee from clogging). Dark, oily beans Grind dark oily beans one or two settings coarser than medium or light brown beans. On the finest settings, it is possible that oil residue from dark, oily beans can clog the Grind Outlet. Clogging and Overflow If your grinder cannot process the water through the grounds, overflow or clogging might occur. Choose a coarser grind size setting.